SUPERSTAR WHITNEY HOUSTON was found dead in her bath at the Hilton Hotel in Beverly Hills on 11 February 2012 at the tragically early age of 48, leaving behind her an astonishing legacy of music that ensures she will not be forgotten. The American singer and actress was renowned for her remarkable voice and exceptional talent and the film Whitney looks at her personal and public life from her birth in Newark, New Jersey in 1963 to her successful bid for stardom, her descent into drug addiction and the circumstances surrounding her untimely death. Whatever happened in her early life that may at some time have turned the tide of events, Whitney was haunted by demons. She always admitted being "brought up in the ghetto", although her father worked hard to bring his family to a safer neighbourhood where his children would get a better education. Whitney wanted to be a singer from an early age. When she was fourteen, Cissy and John divorced. A close family friend known to the children as Aunt Bae, offers some insight into Whitney's childhood and events leading up to her death. Others who share their memories of Whitney include Whitney's brothers, her former sister-in-law Donna Houston, her original manager Danny Gittelman, founder of Arista Records Clive Davis, Creative Director and close friend Robyn Crawford and Publicist Lynne Volkman. Whitney possessed an amazing talent that was nurtured by her mother and by the age of twenty-one Whitney was "blazing her own trail" towards producing the most successful debut album in history. Her days of singing at the New Hope Baptist Church, which she thought of as her second family, had led her on her path to stardom. John Houston managed both his wife Cissy's singing career and later his daughter's career, when her brothers were given roles as part of her entourage. Whitney's brothers, Gary Garland Houston, Michael Houston and John Houston III, talk of their memories growing up with their sister and her astounding rise to fame. Whitney Houston's estate offered their help and support in making this film, and unique access was granted to rare archive footage and previously unreleased recordings to produce an intimate and revealing documentary of the late star's life. Live performances recorded at various stages of her life, original studio recordings and acapellas of some of the Whitney's greatest hits are included along with home movie footage that has never been seen. Her greatest songs include Saving All My Love For You; The Greatest Love Of All; I Wanna Dance With Somebody and the fabulous I Will Always Love You  from the film The Bodyguard, starring Whitney and Kevin Costner. Whitney talks of "having feelings" for Eddie Murphy and Robert De Niro was an admirer, but it seemed that marriage to fellow singer Bobby Brown made her deliriously happy. However, it was not to last. When daughter Bobbi Kristina was fourteen-years-old the then dysfunctional marriage broke up amid the star's accusations of Bobby's abusive behaviour. Sadly, Whitney had already begun the drug addiction she saw as a "bad habit" and became lethargic and disinterested. It took its toll on the beautiful, talented star who seemed to have everything. Her career suffered and she was beginning to realise she needed to get back on track. Tragically she drowned in her bath but was also found to have coronary disease and to have taken cocaine; both contributory factors to her death. Further tragedy for the family was to follow when, in 2015, Whitney and Bobby Brown's daughter Bobbi Kristina was also found face down in the bath. Her partner Nick Gordon discovered her in a coma and she died in a hospice some months later of pneumonia. She was only 22 years old. Whitney is a superb legacy of the talented superstar with the magical voice; the unvarnished and authentic story of the late icon's life in a film that examines both the meteoric highs and devastating lows of her remarkable and unforgettable career. Original Music by Adam Wiltzie; Director of Photography is Nelson Hume; Producers are: Academy Award-wining Producer Simon Chinn (Man On Wire; Searching For Sugarman), Simon's Lightbox co-founder Emmy Award-winning Producer Jonathan Chinn (LA 92; Fantastic Lies) and multi Emmy Award-nominated and Happy Street Entertainment co-founder Lisa Erspamer (Running From Crazy); Executive Producers are: Patricia Houston, Nicole David, Zanne Devine, Rosanne Korenberg, Joe Patrick and Altitude Film Entertainment's Will Clarke, Andy Mayson and Mike Runagail; Written and Directed by Academy Award-winner Kevin Macdonald (Marley; Touching The Void; One Day In September; The Last King of Scotland). * Attitude Film Distribution announces Kevin Macdonald's intimate, definitive account of Whitney Houston's life. 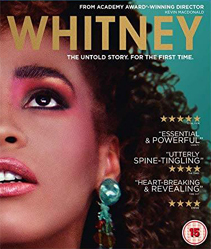 Whitney is released in the UK on DVD, Blu-ray and Digital Download on 29 October 2018. Certificate: 15 | Running Time: 119 Minutes. Extra Features: Audio Commentary with Kevin Macdonald and Simon Chinn. Filmed Soundtracking Podcast with Edith Bowman and Kevin Macdonald.